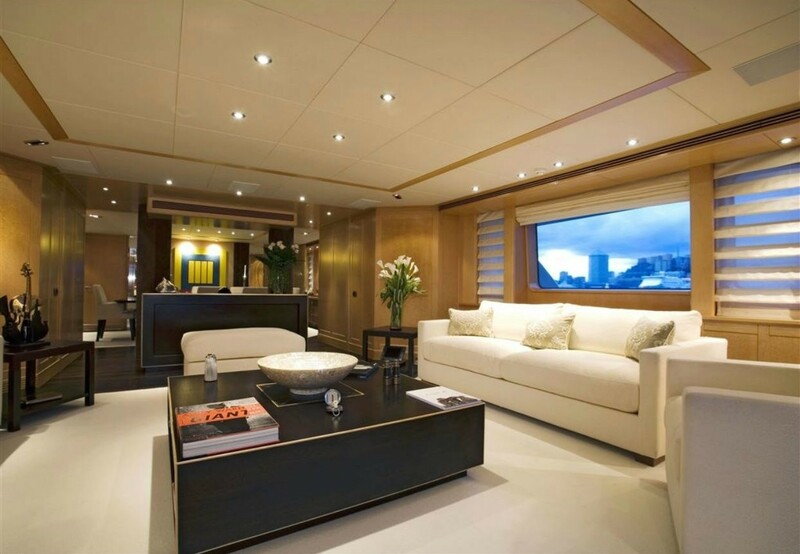 The 44m/144ft custom superyacht was built by Oceanco in 1996 and last refitted in 2017 and offer an excellent option for either family charter, corporate yachting event or a vacation with friends. 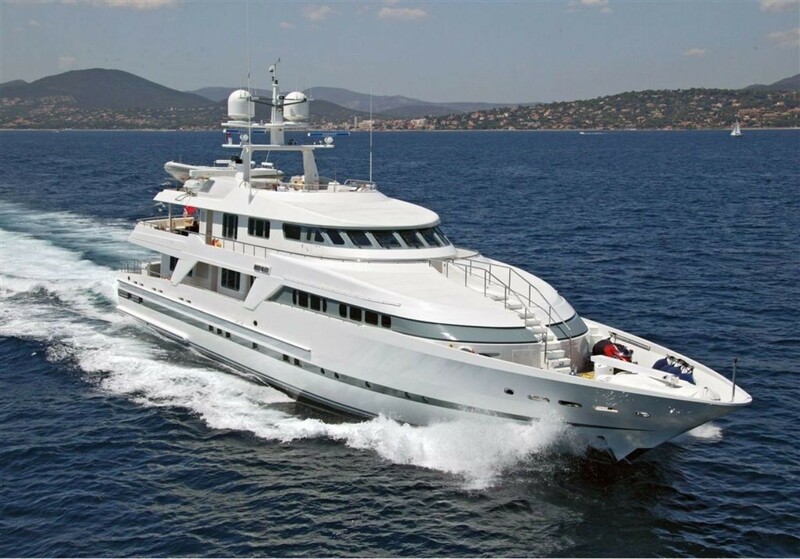 She has an aluminium hull and superstructure and her naval architecture and exterior engineering are the work of The A Group while her interior styling is from Gianrico Fabro and Paolo Rossi. 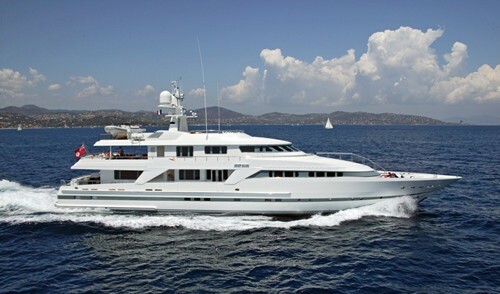 At the Showboats Awards 1996 she won Best Semi-Displacement Motoryacht over 40m. 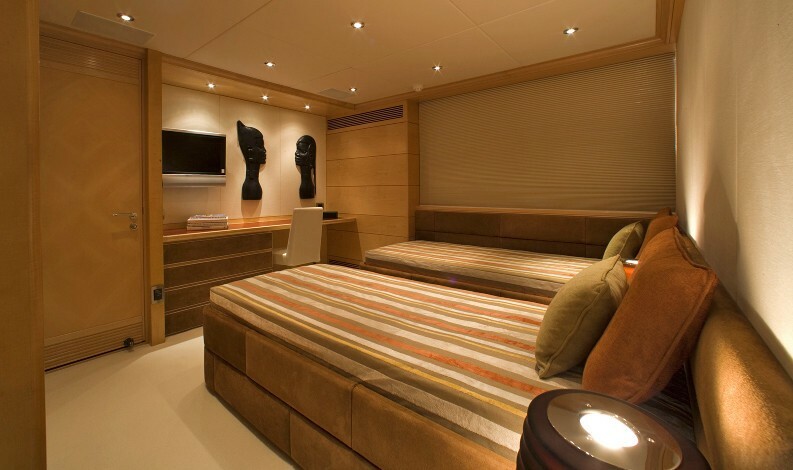 The accommodation sleeps 10 guests over 4 cabins. 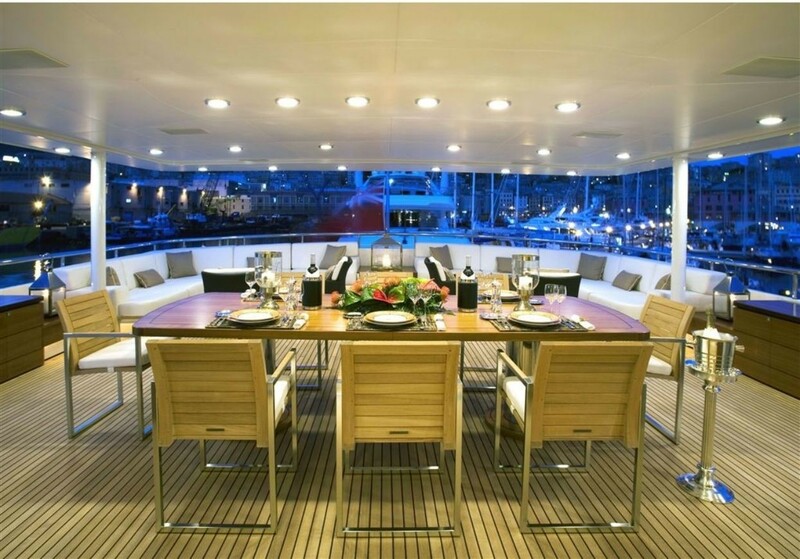 The main deck aft hosts a large table close to the stern seating for dining alfresco or unwinding with hobbies, video and music. 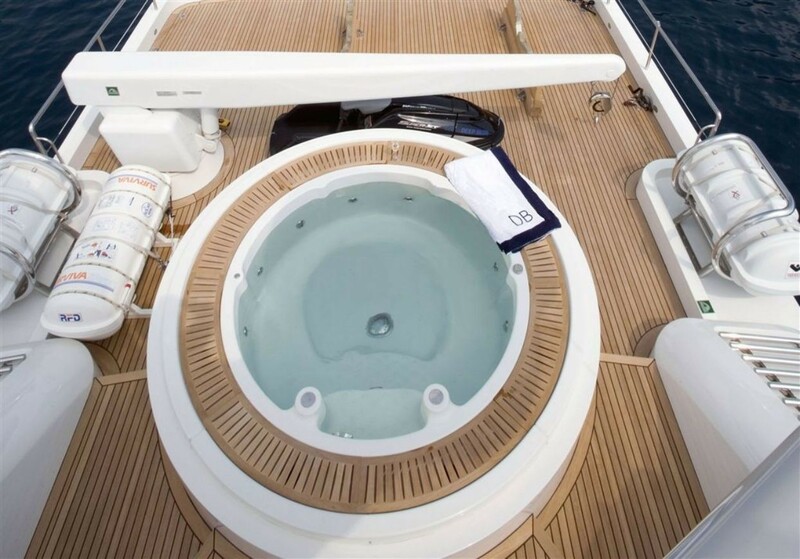 Steps lead down to the swim platform that offers easy access to the tenders and water toys that charter guests can enjoy. 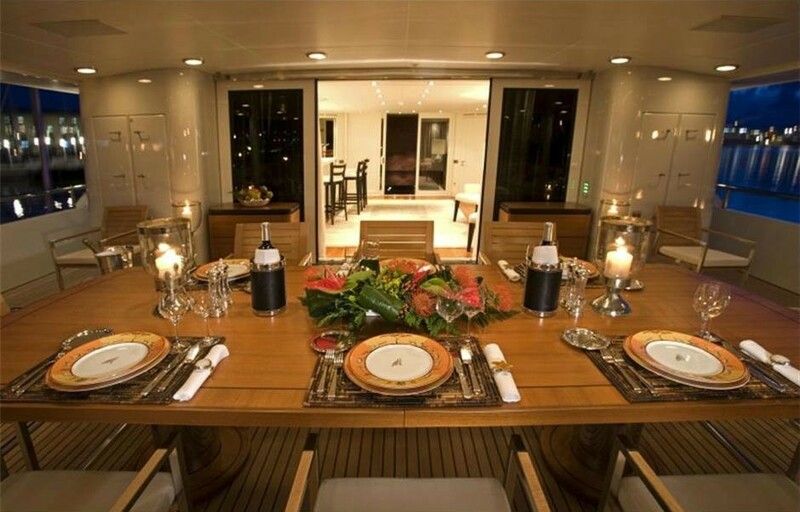 Guests are treated to an atmospheric evening on the upper deck aft, where the sturdy and elegant alfresco dining table will seat up to eight guests in comfort before dividing into smaller groups and sinking into the stern settee for moonlit conversation and games. 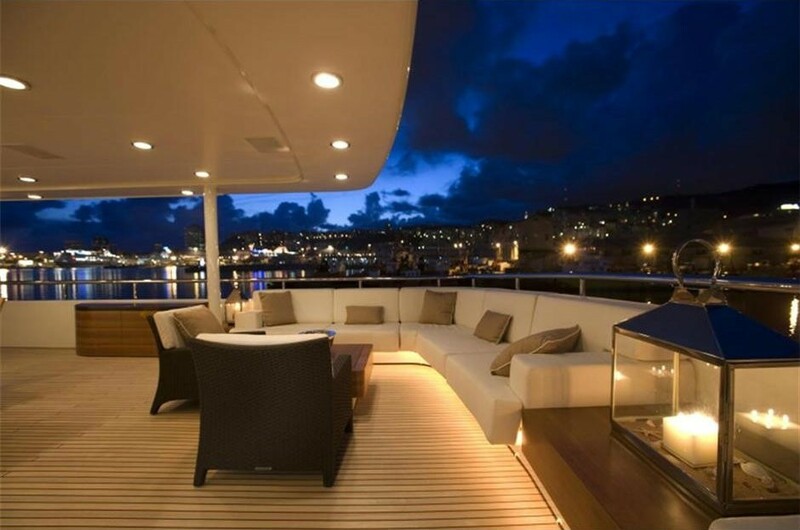 On the sundeck, there is plenty of space for guests to walk around and observe the seascape. 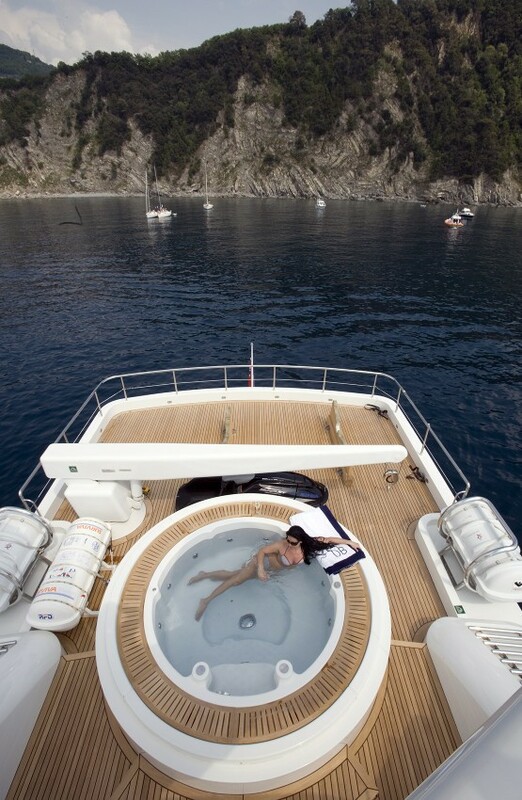 Afterwards, the forward sunpads are the perfect place to take a nap before cooling off in the aft Jacuzzi or dining alfresco in the shade. 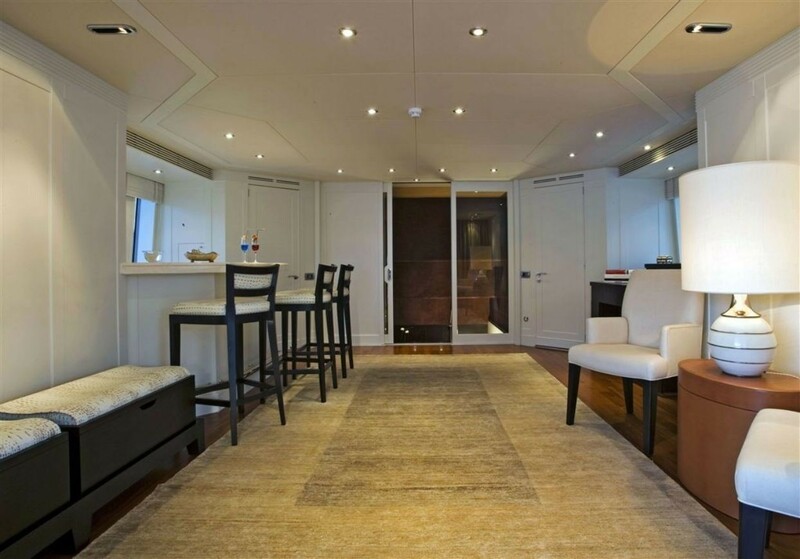 The lower deck layout consists of an aft tender garage, engine room, guest accommodation and crew quarters. 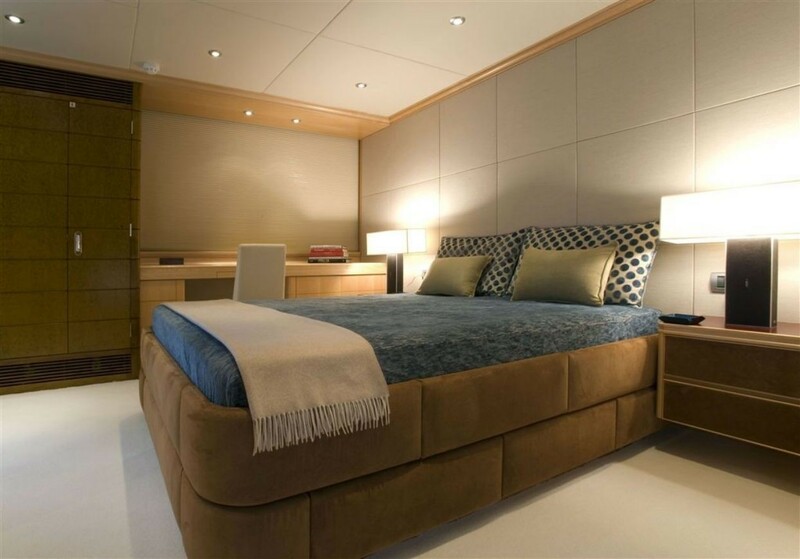 Each cabin has plenty of room yet exudes a cosy ambience for a comfortable night's sleep in clean and contemporary surroundings. 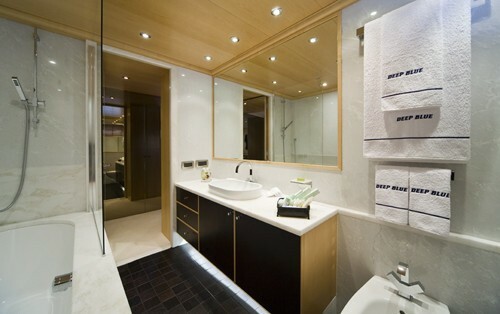 The VIP stateroom has its own private lounge and all three guest cabins have en-suite facilities. 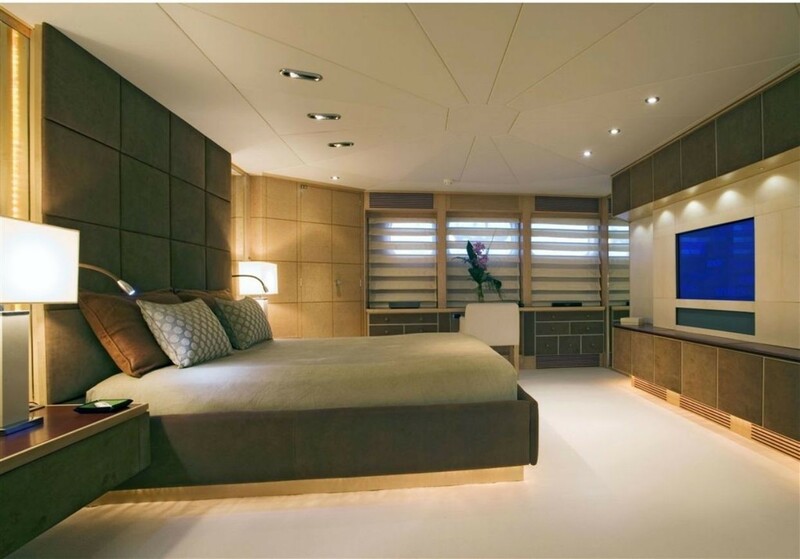 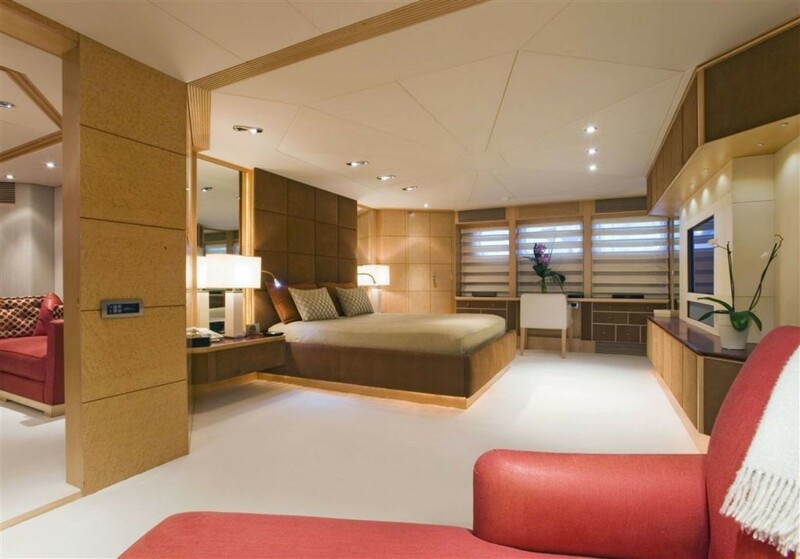 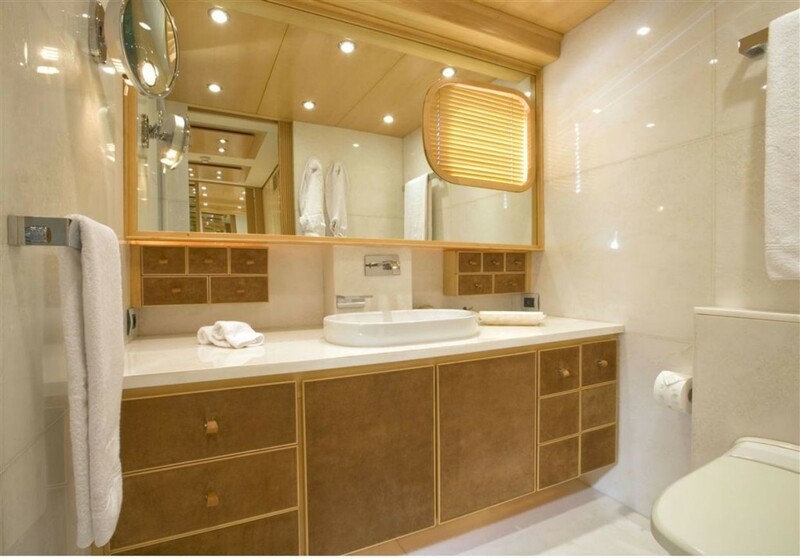 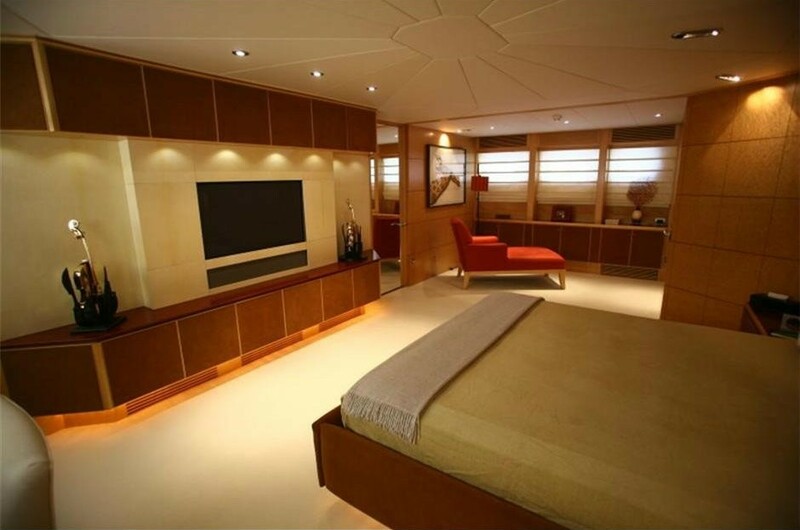 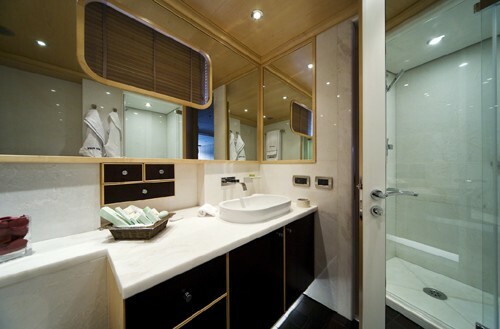 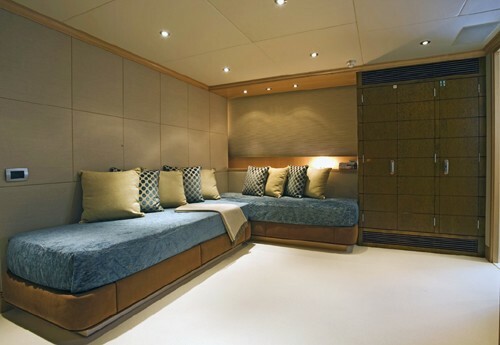 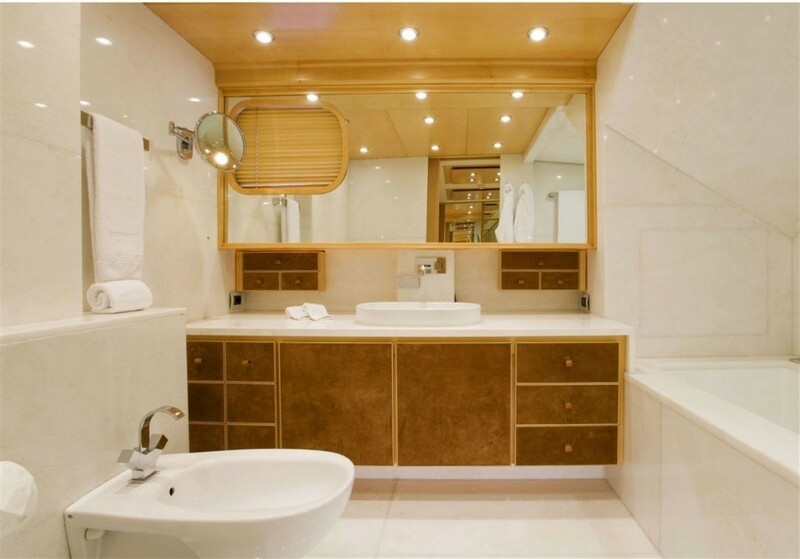 On the main deck the forward Master suite has its own lounge and large en-suite facilities. 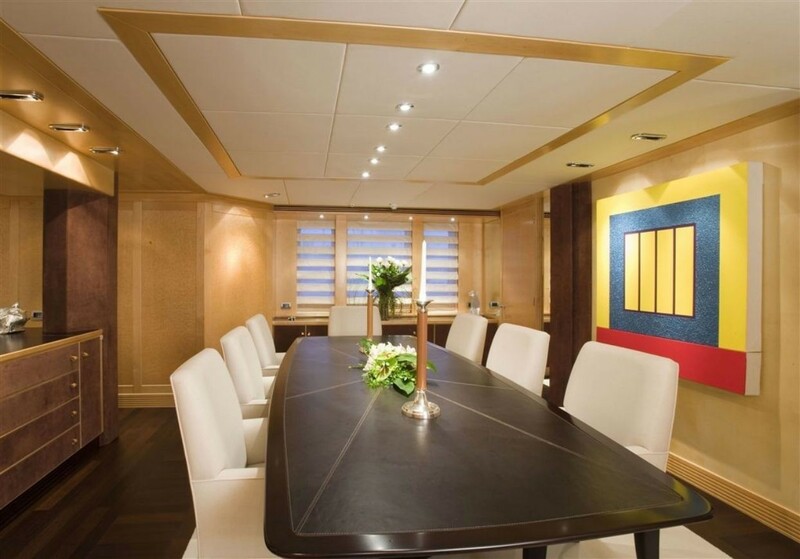 Behind, the foyer connects through to the main salon, where pale wooden panelling and dark, neutrally coloured furnishings form an elegant modern environment in which to share a meal. 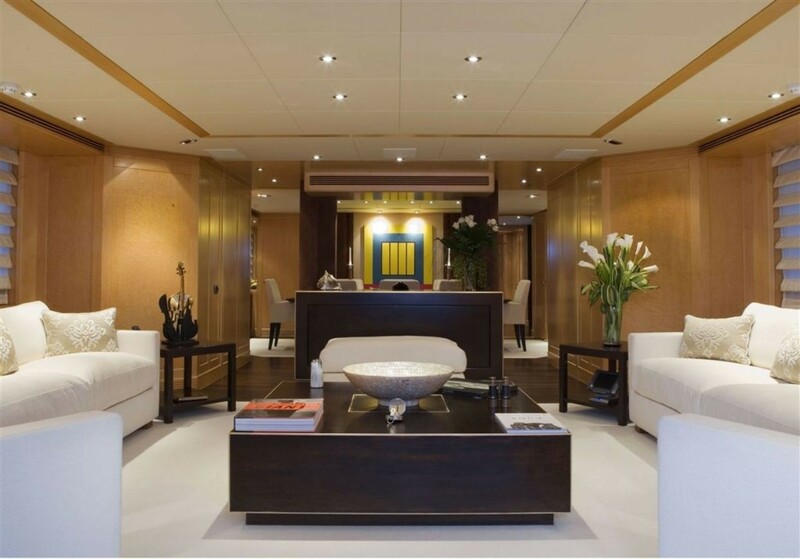 The aft main salon places plush white furniture around a central square coffee table for easy conversation between guests and for watching films together on the 54" plasma HDTV. 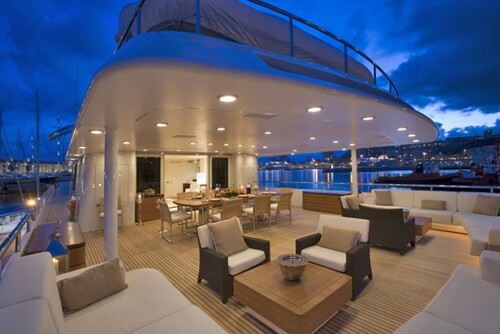 The helm station is located forward on the upper deck and the Captain's cabin is immediately behind. 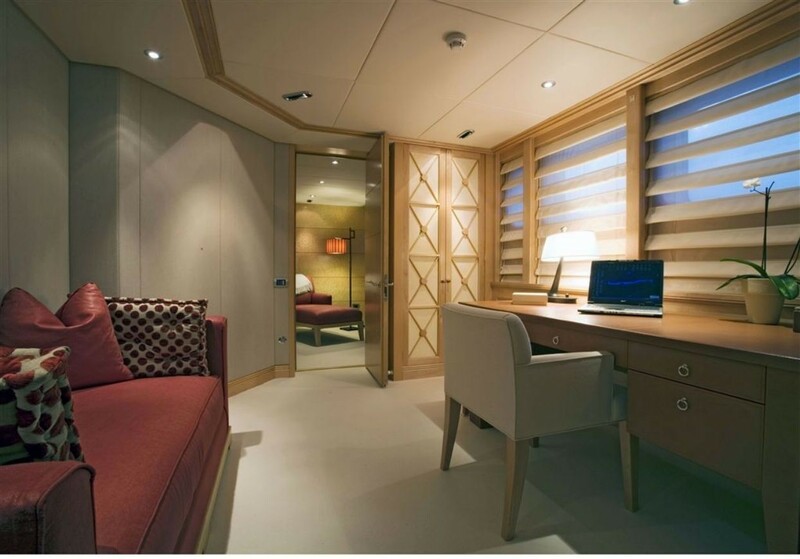 To the aft, the skylounge provides a second beautifully styled salon for guests to spend time on personal pursuits or engage in private conversation. 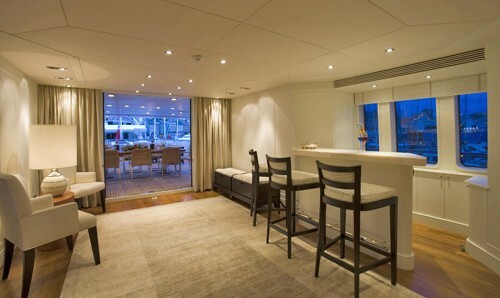 There is a bar for refreshments throughout the evening and to accompany a meal on the upper deck aft. 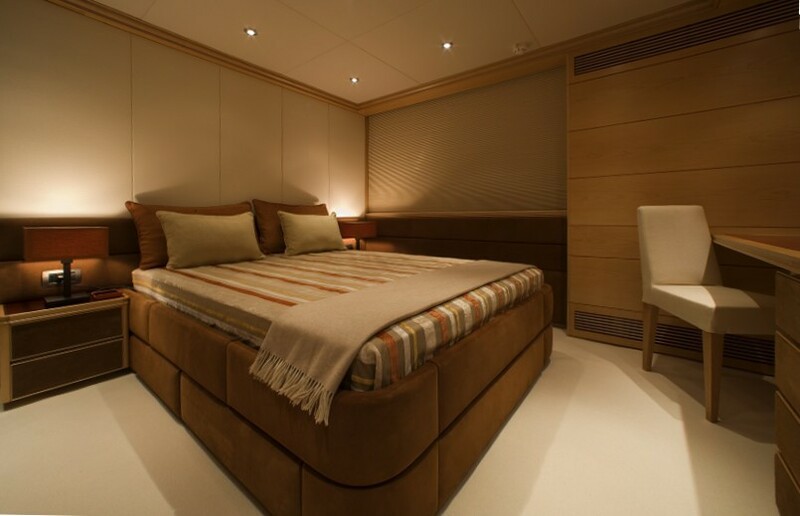 Up to 10 guests are accommodated over 4 cabins: 1 Master suite, 1 VIP stateroom, 1 double cabin and 1 twin cabin. 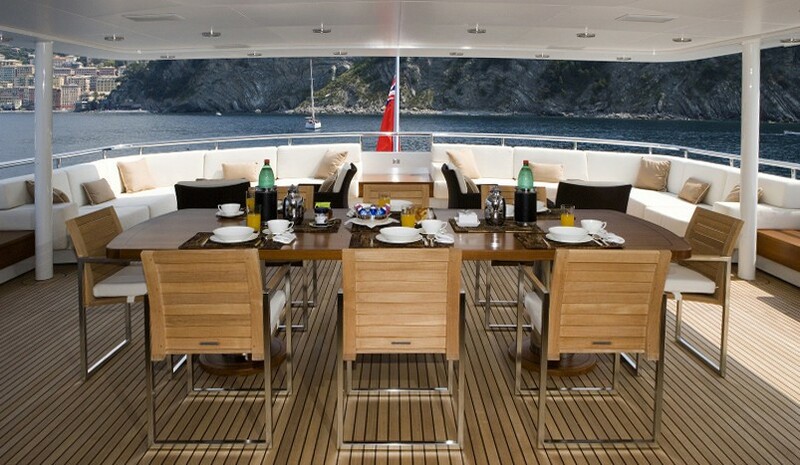 The professional crew of 9 will ensure that everyone on board is well taken care of throughout the journey. 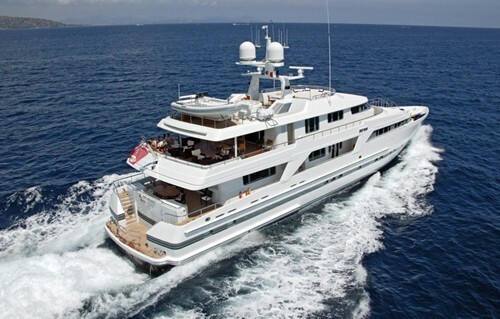 We do have available further amenity, owner and price information for the 43.80m (143' 8") yacht 44M CUSTOM SUPERYACHT, so please enquire for more information.